This is a continuation of the Safety and the Students at Hamilton Southeastern Schools, Part 1 article. Christi Thomas talked about communications and the use of safety specialists within HSE. It is required by state legislation for school districts to have at least one safety specialist. HSE has 40 trained specialists on staff with at least one in each of the 21 schools. In addition to having safety specialists, each school also has a safety plan that include an emergency reference guide. These plans are available in flowcharts for easy use to those that need them. These are not made public because, as mentioned before, their confidentiality helps in providing security to the schools. The overall program for the safety specialist is led by the safety coordinators, Christi Thomas mentioned earlier and Ryan Taylor. Additionally, the Indiana School Safety Specialists Academy (ISSSA) is used. While school shootings have been the topic in the limelight, there are other issues that are rare, but real as well. The safety specialists don’t want to be too distracted from issues that happen more often. This can include issues such as seizures in class, missing kids, or even gas leaks. The little things that happen every day are important to manage as well as those rarer issues. One area that the schools focus on for safety is ALICE. More can be found on the ALICE program at www.alicetraining .com. Alice stands for Alert, Lockdown, Inform, Counter, and Evacuate. It is a program that addresses methods to proactively handle a thread such as an aggressive intruder or active shooter. 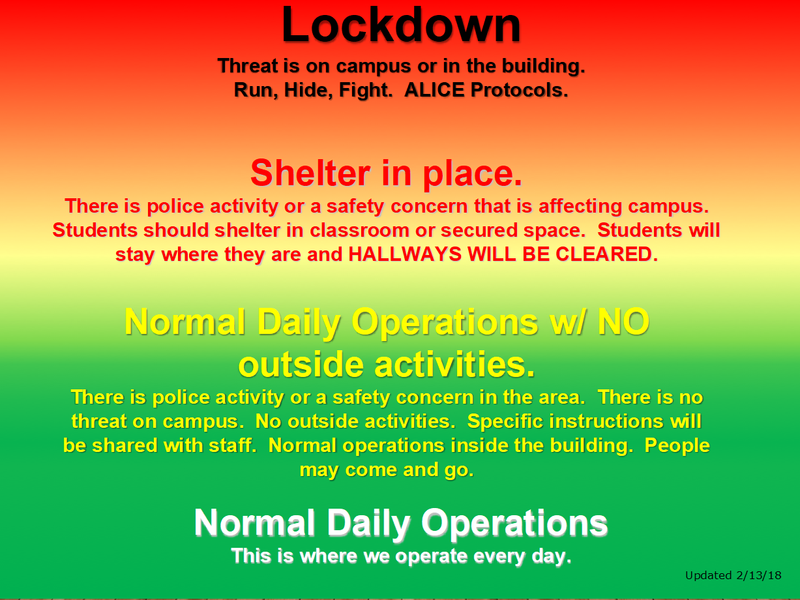 While the acronym includes the phrase lockdown, the core of the ALICE training is that each situation is different and thus students and teachers need to know the options they have in dealing with situations. The ALICE training site has a lot of information for individuals, organizations, and more. One area of ALICE that has caused controversy is the “C” for Counter. This was addressed with the statement that “If you do nothing, bad things will happen. If you do something, then bad things might happen.” The protocol of hiding in the corner is no longer considered a good approach. Distracting or otherwise taking action is considered a better approach. A reference was made to Virginia Tech, where it was noted that the kids that ran and fought were the ones that survived. HSE schools are ahead of the curve on some of the programs that have been implemented in regard to safety. Again, while all the changes were not discussed, there are several key programs that have improved the safety of the schools within HSE. One of the biggest changes that occurred after Sandy Hook has been the revamping of the primary entrances to schools to give better access control. During the daytime hours, visitors are required to enter through the schools’ main entrances. In the past, small cameras were used with a buzzer for people to request entry into a building. This has been completely replaced with vestibules that were designed for a more secure entry. These include laminated glass doors that allow the office staff to see anyone requesting to enter the building. Unlike the cameras, the staff can get a full view of the person along with their body language. The previous use of buttons and cameras didn’t allow for this level of visibility. In the few cases where the vestibules couldn’t be added, high definition cameras and other monitoring have been added to increase the visibility of who is entering. There are also multiple sets of doors. These doors provide delays in people getting into the building. The idea of “delay, delay, delay” is a part of the security strategy. Slowing down a person’s ability to get into the school increases the time for those within the school to react. Many of the schools have included glass walls for visibility and a more open concept. 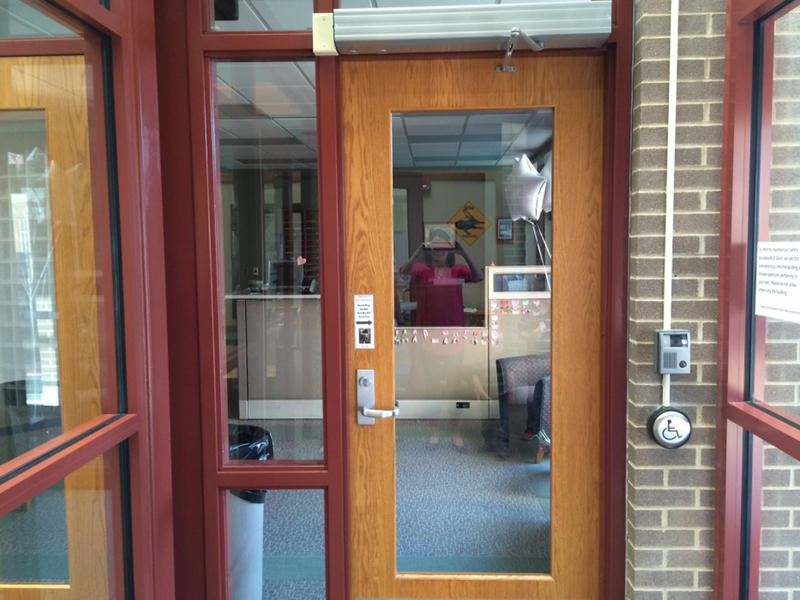 The increase of glass in school designs is a safety concern that often gets brought up. It is important to know that the entry doors and glass walls are laminated. While this is not bullet proofing, it does prevent the glass from shattering. It was stated that laminated glass walls are as safe or possibly even safer than walls made with drywall. An additional safety feature is the use of background checks. All visitors to HSE schools are required to have a recent background check on file. While many people feel that background checks are silly, they are a key part of the safety strategy that started about 12 years ago. HSE currently uses Safe Visitors out of Plainville, Indiana to do the checks. If a person has an issue on their background check, then they will not be allowed to enter the buildings during the school day. It has been stated that several people have complained about not being allowed to sit with their child at lunch, to volunteer, or to attend a class party. Regardless, the school system has indicated that if a background check isn’t clean, then a person won’t be allowed into the school. Teachers also get background checks when they are hired as well as every five years after. One of the areas that the district has been working to improve is communication. Communication can occur anywhere from a one-to-one level all the way up to district wide communications using. There are a variety of avenues for communicating that include the district web site that is being updated to the Skylerts that send emails and text messages. With staff, the district uses a set of redundant tools that range from telephone calls to texts to emails and emergency radios. The school system has put in place common language in the form of the Common Language Safety Chart that is to be used when discussing issues. The following figure shows the wording used based on the level of threats that might occur. Safety is an area that will require constant updating. As threats evolve, so must the plans and efforts to insure the safety of the kids attending our schools. Members of the HSE school safety team do regular evaluation of school incidents that occur in other cities, states, across the country, and even internationally. There are debriefings that occur on school safety incidents. Additionally, there are regular reviews as well as an annual ISSSA certification. This article continues with Safety and the Student at Hamilton Southeastern Schools, Q & A.